Bud drop: The premature dropping of flower buds. The cause of this problem is primarily environmental. Temperature fluctuation due to drafts is commonly seen as a cause. Bud drop can also be caused by the lack of or excess water and changing light levels. In Christmas cacti, a lack of potassium or an excess of nitrogen can also cause this problem. Sometimes buds fall off a cactus simply because the plant has too many blossoms. Rough handling or turning a plant also will cause buds to abort. It is important to maintain the care that a flowering cactus is used to when it is in bud. Resist moving your cactus to another site if it has buds or open flowers. Corky scab: Brown, irregular spots developing in older parts of a stem. Most of the spots affect the epidermis of the plant only, so, damage is superficial and only affects the appearance of the plant. More severe or widespread attacks can destroy entire shoots or decrease flower production. Corky scab is normally the result of poor cultivation (i.e. overwatering, poor ventilation). To control, increase light exposure and decrease humidity. The prickly pear (Opuntia sp.) are particularly prone to corky scab. Etiolation: The abnormal elongation of cactus stems due to insufficient light. Stems may be pale or yellow with unusual spine characteristics. Commonly seen in plants taken from a commercial nursery into a dimly-lit retail environment. This may also occur if a cactus is fertilized while in its normal Winter dormancy period. To correct etiolation, move the cactus into stronger light. While this will prevent further etiolation, the spindly elongated section of stem will remain as proof of improper care. You may also choose to prune the etiolated stem back to the healthy part; this acts to promote the growth of 'perfectly-shaped' offshoots or stems that may be removed and re-planted. Rot: Rot is caused by microorganisms: fungi and bacteria. It may affect the roots, stem, and/or the crown of the plant. Typically, the diseased tissue takes on a watery, slimy, soft, and blackened appearance. Damage often starts at the base of the plant and progresses to the top. Plants start to lean, then often collapse and die. 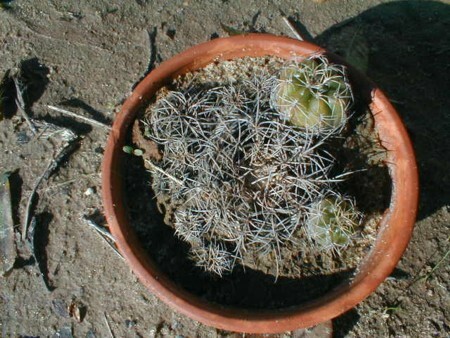 Overwatering, particularly in cold weather when cacti are dormant, is the chief cause of the problem. The disease-causing organisms thrive in moist conditions. Cold temperature and plant wounds aggravate the problem. In theory, rot in its early stages may be checked by moving plant to a dry, temperate environment. It has been our experience that once you spot rot it is already progressed past its early stages. If rot is above ground, cut out the diseased portion of the plant with a sharp knife and dust the wound with a fungicide. In many cases, the top of the plant appears healthy above a rotten base. This healthy top may be cut off, allowed to dry, and then re-rooted in a sandy medium. Remove and destroy infected plants and/or plant parts. Proper cultural practices help to prevent rot. Sterilizing the potting media and placing a layer of gravel on top of the soil will kill or reduce bacterial damage. Water plants early in the day and avoid spreading disease by splashing water from one infected plant to a healthy plant. In Winter, the normal dormancy period for most cacti, water sparingly. A partial list of rot-inducing microorganisms include: Fusarium oxysporum, Phytophthora parasitica, Pythium aphanidermatum, Bipolaris cactivora, Erwinia carotovora. Sunburn: A change in the appearance in the plant due to too much exposure to the sun. The entire plant epidermis will turn a whitish, yellowish or reddish-brown color. In extreme cases, a sunburned plant may become sensitive to other diseases. As mentioned, this disease is caused by too much light exposure. Typically, this occurs when rapidly bringing plants used to artificial light into intense natural light. Epiphytic cacti and seedlings are especially sensitive to sunburn. To prevent, a cactus should be gradually introduced to more light over a period of time. Plants should be placed into the shade, then into partial sun, and finally into full sun; this process may take one month. If you notice signs of sunburn, move the plant temporarily back into the shade. Also, sunburn is aggravated by hot weather and lack of water, so, make sure the plant is properly watered.